Is there a way for me to control how many workouts my client can see? You can adjust your visibility settings across all clients, or on an individual basis. To access your global visibility settings, click Account > Settings > Client Workout Visibility. By default, your clients are allowed to see the current week. This means that their workouts for the entire week (Monday-Sunday) will be released the Sunday prior. If you would like them to always see one full week ahead, you'll want to override the setting to allow 7 days. 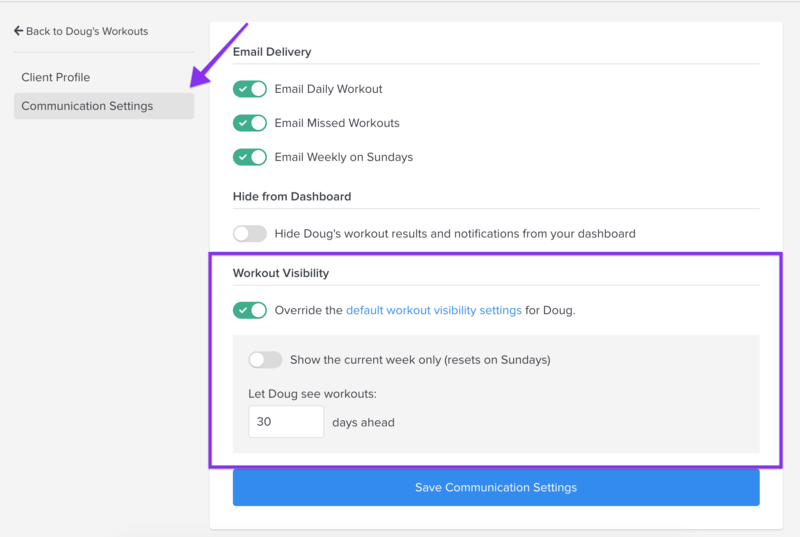 On an individual basis, you can access the client's visibility settings by going to the client's workout calendar, clicking Edit Client, then Communication Settings. This is a good place to check if your athletes are telling you they can't see their programming for the week!